Do you want to become a better handler? Upon popular request, we are now offering an educational program for those who wish to learn more about the training and go above an beyond as a bird dog handler. 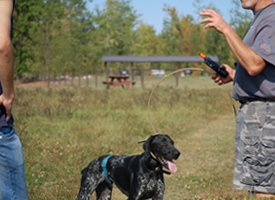 We stress "above and beyond" since all dog training programs include the necessary owner/handler education. handling multiple dogs at multiple levels of training. Through this program you can choose to take approximately 5 hours out of your day or you may stay for nearly one week (Tuesday-Saturday, Noon). You are welcome to bring a personal dog. We will fit your dog into the routine of the day, but training him/her will not be the sole focus. Furthermore, you are also welcome to bring an immediate family member to join you in this experience. PRICE: $150 per day (approximately 5 hours) or $600 per week (approximately Tuesday-Saturday, Noon), plus tax. We kindly ask that participants make their own arrangements for meals and lodging. On site camper hook-ups, water and electricity, are available and included upon request.